Dark money is one of the most subtle, yet powerful forces in the political fundraising realm. 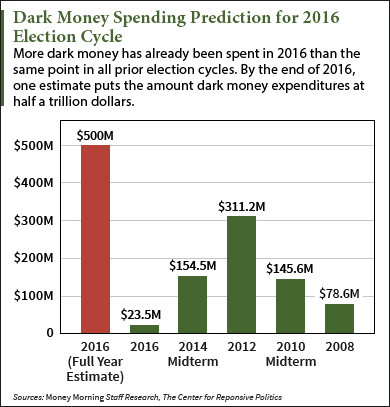 And like in prior election cycles, 2016 will be another big year for dark money spending. The term "dark money" was coined by the Sunlight Foundation, a nonprofit that advocates for a more open and transparent government. It researched political spending groups during the 2010 midterm election cycle. That was when the organization came across fundraising groups that the Federal Election Commission called "social welfare organizations." Sunlight found that these so-called social welfare groups weren't required to disclose the identities of their donors. In fact, they were barely required to report any donor or financial information whatsoever to the FEC. This made them notoriously difficult to track. It started referring to these shady organizations as dark money groups. The term has also caught on with other organizations that track money in politics, like the Center for Responsive Politics. The phrase has even been used in books about campaign finance. Dark money groups channel millions of dollars into election cycles to try to influence your vote through advertisements and mailers. And these groups want their donors to stay hidden as much as possible. Organizations like the Sunlight Foundation and the Center for Responsive Politics are leading efforts to expose dark money groups. We talked to the head of the Center for Responsive Politics' dark money research team, Robert Maguire, about a record-breaking amount of dark money that could be spent in 2016. Maguire said he wouldn't be surprised if dark money organizations spent close to $500 million in this election cycle. "It would be a record," Maguire said, "but it would fit in with all the things we've seen develop." One of these developments is the inability of the IRS and the FEC to regulate dark money groups, Maguire said. These groups are protected by high-powered lawyers that help them exploit every loophole in campaign finance laws. This makes dark money incredibly appealing for wealthy donors who want to influence elections. Take Crossroads GPS, for example. It's a favorite dark money group among conservative donors. Crossroads has been active in election cycles dating back to 2010. 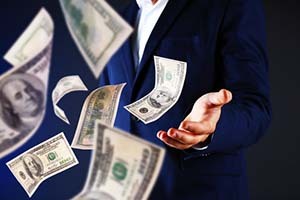 The group has raised and spent a total of more than $330 million between June 2010 and December 2014, according to the Center for Responsive Politics. According to Maguire, Crossroads GPS fought a battle with the IRS over five years to obtain tax-exempt nonprofit status. But Crossroads' savvy lawyers helped it achieve full nonprofit status in November 2015. Crossroads was already a 501(c)(4) social welfare organization before it was granted 501(c)(3) nonprofit status. And dark money groups aren't required to be validated by the IRS. Now, Crossroads' new tax-exempt status will make it even easier for the group to hide its donors – and attract more of them, too. See just how alarming Crossroads GPS' fundraising and spending tactics are in this short video. Look for Crossroads to actively promote Republicans for the Senate races in 2016. As for the presidential race, Maguire said Democratic front-runner Hillary Clinton will be not nearly as reluctant as President Obama was to utilize dark money groups in her presidential campaign. In fact, Maguire said Clinton's allies already started fundraising for her years before her presidential run. And on the Republican side, Maguire said, it's difficult to predict anything with the GOP's presumptive nominee, Donald Trump. "If he's (Trump) made anything clear," Maguire said, "he's the most expedient candidate that we've had in a long time. He can change positions with almost no accountability. And outside spending might still be one of those things." So far, a conservative social welfare group called the American Future Fund has spent the most money out of all dark money groups this election cycle, at $8.7 million. The group's site said it was founded to promote conservative and free market principles.